Description: WB TOFC, 7th Avenue, 0743 hours. Description: Check out where the class lights were covered and still show a little red. Title: NS EB 18G Opens Up @ 1054 hrs. 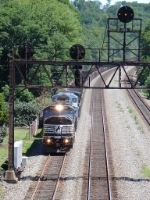 Description: A single ex-CR SD60M glides through BB with 64J behind. Title: EB Trash Train 64J @ 0832 hrs. Description: So yeah this isnt the shot I wanted...but was all I could get after a car passed right after this shot was taken and knocked my focus out of whack. But im still happy with it. Description: Eastbound hauling empty hoppers passes a westbound mail train. Description: A southbound crosses over Colsan Junction. Description: Eastbound on track one with a pair of widecabs. Description: NS SD60M #9767 leads a mixed freight west through Pine Junction at dusk. Description: Fourth engine on 11R. Works for the Pickens Railroad in SC. 6797 the third unit was not starting and was set out in Front Royal. Description: 1st train of the day!!! Description: The daily NSI comes in on the Midway sub as it heads up to Northtown Yard. Cool to see two former Conrail units together. Description: A repainted Dash 8 with a cool looking white brow comes under Raymond Ave on the NSI.